An unexpected guest from Bali, which hitched a ride in a suitcase to Adelaide, has been identified as one of Australia’s 10 most wanted pests. The stowaway Asian black-spined toad, which breezed through customs, was spotted by Michael Penno and his family on their dog’s bed at their home in the Adelaide suburb of Mile End. Little did they know, the toad they named Elvis was a priority declared species in Australia and is closely related to the well-known common pest the cane toad. Mr Penno said at first he thought his pet must have brought it inside from the backyard. “I was almost into Bonython Park about to drop it in the [River] Torrens when I thought ‘maybe we’ve brought this thing home with us’,” he told ABC Radio Adelaide. Mr Penno said the toad must have snuck into one of their shoes before the family packed their bags in Bali. “The villa we were staying in Bali was called Graceland, so the natural name for it was Elvis,” he said. “What we think happened is, it was customary in the house that we were staying in to leave your shoes outside so we’re not sure if it snuck into a shoe. 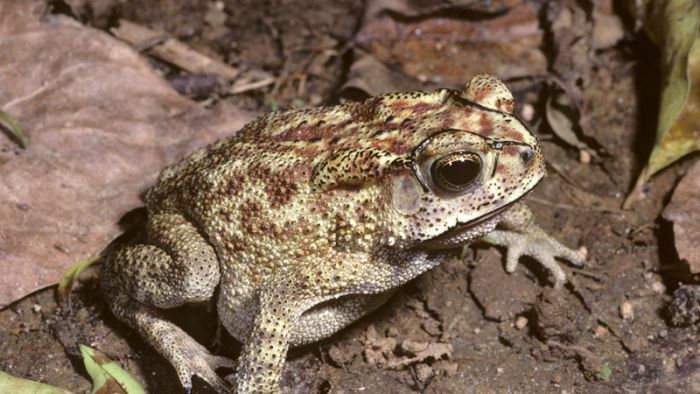 PIRSA Biosecurity SA executive director Will Zacharin said the toad was often mistaken for native Australian toads but it was widespread and abundant throughout south-east Asia. He said the Asian black-spined toad was a stocky toad with a small head and short limbs. “Their back is covered with pimple-like warts that are often surrounded by a darker pigment and capped with distinctive spines,” he said. “There is also a prominent black ridge over each eye, which meet at the nose. He said while there were no known populations in Australia, the black-spined toad could survive and breed in cooler southern states including South Australia. Environment Minister David Speirs used the incident to remind South Australians to check their luggage for stowaways when packing from an overseas trip. He said it was fortunate the toad had been handed in. Mr Speirs said increasing numbers of the pesky toad had been found along the country’s borders but biosecurity measures were working. “To the best of our knowledge the Asian black-spined toad is not known to be in Australia, but increasing numbers of them are being intercepted at Australian airports and sea ports, arriving on planes and ships originating from Asia,” he said. “Australia and South Australia are fortunately free of the world’s worst pests and diseases largely due to the strength of our biosecurity system and some of the strictest biosecurity conditions in the world.